Democratic challenger John Kerry has publicly admitted defeat in the US election, giving President George W Bush a second term in office. "I would not give up this fight if there was a chance we would prevail," he told supporters in Boston. "Today I hope we can begin the healing," he said. Mr Kerry earlier telephoned Mr Bush to concede the state of Ohio, whose 20 Electoral College votes held the key to victory in a cliffhanger election. Mr Bush is expected to make a victory speech at about 2000 GMT. Mr Kerry said he and Mr Bush had spoken "about the danger of division in our country and the need, the desperate need, for unity". Mr Kerry's running mate John Edwards praised the defeated senator as a "great American". With Ohio, Mr Bush now has 274 Electoral College votes, four more than needed for victory. Mr Kerry has 252 votes. Results are still awaited in New Mexico and Iowa but they cannot affect the outcome. The delay in declaring Ohio a win for Mr Bush came about because the Democrats said there were a substantial number of uncounted absentee and provisional ballots that could still have clinched it for Mr Kerry. 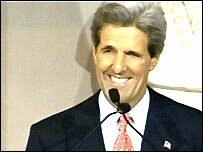 But in his concession speech, Mr Kerry said it was clear that there were not enough outstanding votes to win Ohio. He said it was vital that every vote must count and be counted, but the outcome should be decided by voters, not a protracted legal process. President Bush will enter his new four-year term in office with strengthened Republicans majorities in both houses of Congress. Mr Kerry phoned Mr Bush to concede shortly after 1600 GMT. In a four-minute conversation, Mr Kerry congratulated the president, while Mr Bush called the Democrat "an admirable, worthy opponent". White House staff said the president had described his rival as "very gracious" in defeat. The result means Mr Bush has a stronger mandate than four years ago, when he won only after a 36-day legal battle over a recount in Florida. In 2000, Mr Bush finally won Florida by 537 votes, but this time he won an undisputed victory, with a projected five-point lead over Mr Kerry. One third of seats in the Senate and the whole of the House of Representatives were also at stake in this election. Republicans have tightened their grip on the Senate, defeating Democratic leader Tom Daschle in South Dakota and capturing a string of seats across the South. Mr Daschle is the first party leader to lose his seat in more than 50 years. Projections put turnout in the presidential election at more than 115 million voters - 10 million more than in 2000. The projected vote showed Mr Bush leading Mr Kerry nationwide by three-and-a-half million votes. White House chief of staff Andrew Card had earlier hailed a "decisive margin" of victory for Mr Bush. 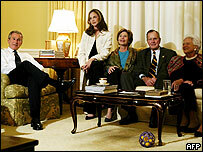 Two US television networks - NBC and Fox - called Ohio for President Bush several hours before Mr Kerry's concession. Initially, the Democrats responded defiantly, with Mr Kerry's running mate John Edwards telling supporters in Boston that they would "fight for every vote". But the BBC's Rob Watson in Washington says that, in the end, it appears John Kerry felt he was just too far behind in Ohio to continue to fight and to add to the country's divisions.